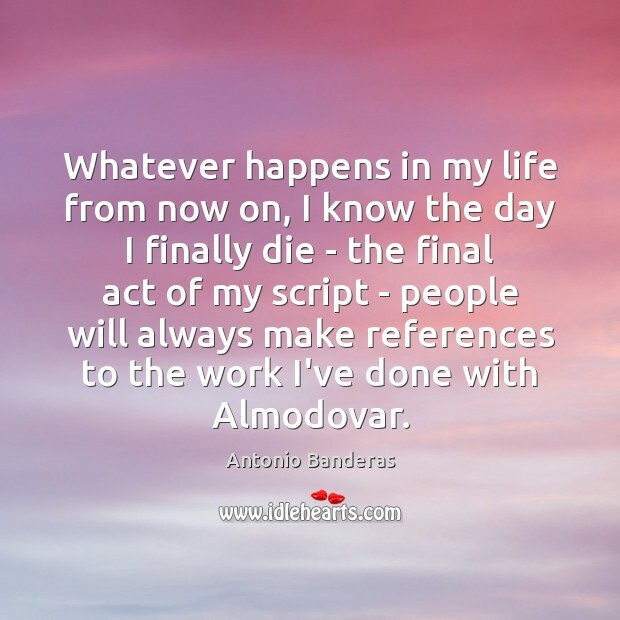 Quotations about Almodovar. Quotes to stimulate mind and drive action! Use the words and quote images to feed your brain inspiring things daily! I'd love to do a Michel Gondry film. That would be ideal! I'd love to do an Almodovar film; you know, I think he's very, very talented. I don't care that people say he's pretentious. So what? 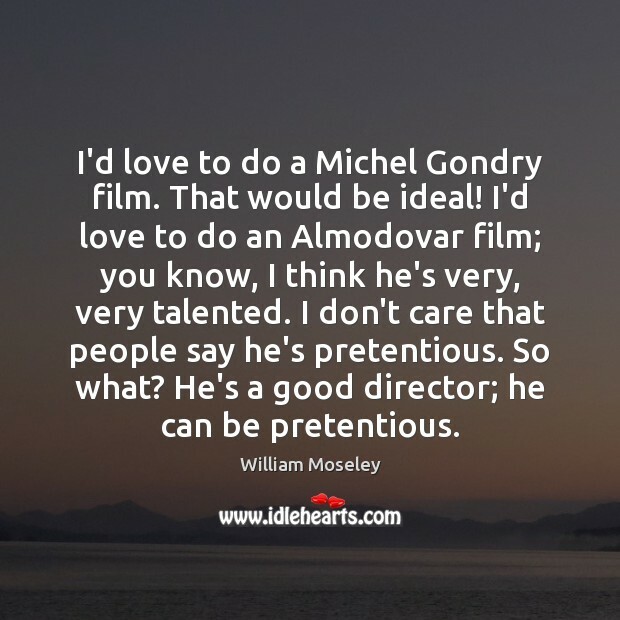 He's a good director; he can be pretentious. 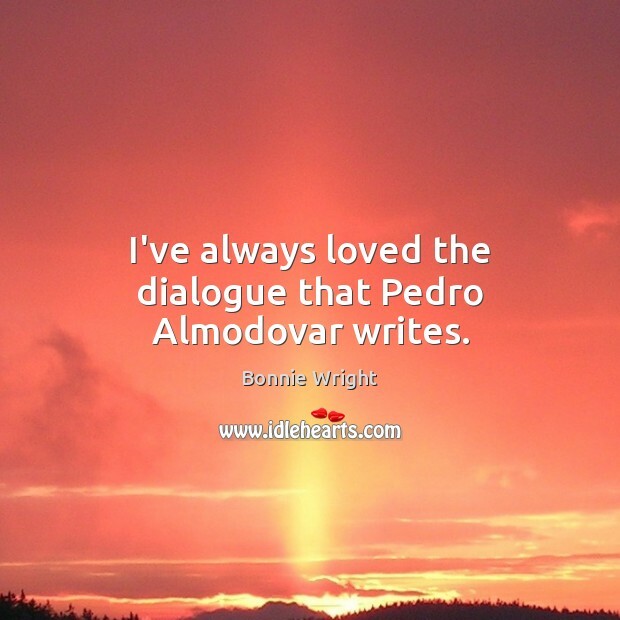 I've always loved the dialogue that Pedro Almodovar writes. I would love to work with Quentin Tarantino - he's my number one. My ultimate. I would love to work with Paul Thomas Anderson, Alexander Payne - Pedro Almodovar wouldn't be too shabby. There are so many good directors, but those are some of my favorites. I discovered very soon, especially for movies, because I started in theater, that every director has his own universe. You have to be free enough to try to understand what he wants from you. Especially when that director has a tremendous personality. And I'm talking about people like Pedro Almodovar and Robert Rodriguez and Quentin Tarantino and Woody Allen. And you have to adapt. If you don't adapt to them, you are off the thing. Whatever happens in my life from now on, I know the day I finally die - the final act of my script - people will always make references to the work I've done with Almodovar. Sometimes, when things go well on a set, or when you are working with somebody like Pedro Almodovar, Woody Allen, Rob Marshall or somebody so talented and so inspiring, it's really beautiful, what happens there.